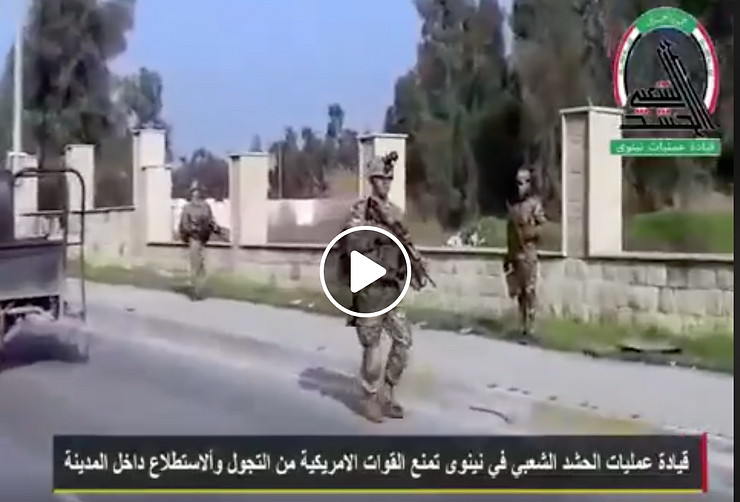 A video emerged on February 1 showing US forces on patrol in eastern Mosul and units of the Hashd al-Shaabi or Popular Mobilization Units appearing to monitor their movements closely or attempt to interdict the US patrol. According to areport uploaded to Mosul Plus, the incident involved not only the incident that took place in late January, but also a subsequent statement warning US forces against further “provocative” acts. The incident in Mosul comes as the US is seeking to withdraw from Syria and amid increasing calls from members of the PMU for US forces to leave Iraq. It also comes amid US tensions with Iran and amid the 40th anniversary events for the Islamic Revolution. The PMU includes numerous militias that are closely linked to the Islamic Revolutionary Guard Corps (IRGC) in Iran. On January 28 Qais al-Khazali, leader of Asaib Ahl al-Haq which is part of the PMU, said that there was no reason for US troops to remain in Iraq. A former detainee of the US, he “suggested U.S. troops may eventually be driven out by force if they do not yield to the will of the Iraqi people.” Member of Congress have sought to sanction his militia last year. Iran’s Press TV has also reported the threats against the US and demands for withdrawal, which have increased since 2017. Kata’ib Hezbollah, another unit of the PMU, made similar threats in June of 2018. Harakat Hezbollah al-Nujaba also threatened US forces in January 2018. Locals say the incident took place on January 31. Rezvan al-Anzi, a PMU deputy commander, said on Saturday: “We consider this act by the US forces deliberate provocations, hence we acted directly, closed roads and warned them.” The videos of theinitial incident and subsequent statement have been put online. 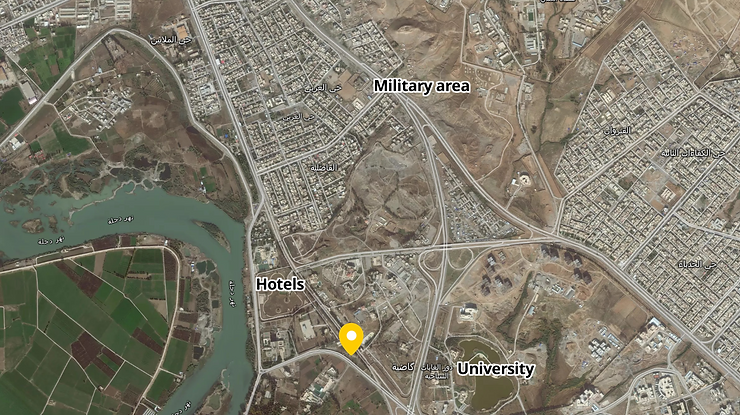 Through contacts from Mosul and geolocating assistance on social media we were able to determine that the incident took place near the University, not far from theluxury hotel area that the Nineveh International or Oberoi is located. This area also contains a military base and Saddam-era palace. Locals say that the incidentis a sign of worse to come and could inflame tensions. Mosul was liberated in the summer of 2017 and since then has made impressive strides. Cultural events have helped the city heal and students returned to the University. But destruction remains and bodies were still being found in the ruins of western Mosul last year. Recently a building that ISIS had used for executions was torn down. The video made by the PMU includes patriotic music which indicates the martial message. The base near where the incident took place (sometimes referred to as Al-Qathia) is used by the US-led Coalition and the Iraqi military. The PMU has a base nearby, around 100 meters from the main gate of the Iraqi base. The base is frequently used by helicopters, which can be seen in the video of the incident. Chinooks and Black Hawks often land there. The video also raises some questionsabout the US patrols. The soldiers appear to be patrolling on foot and it is not clear what the purpose of the patrol is or how frequent these patrols take place. During the liberation of Mosul US forces were acting to advise and assist the Iraqi army to re-take Mosul. The Coalition said they did not work with or coordinate with the PMU, but worked “by, with and through,” the Coalition’s partners, which were the Iraqi army or Federal police and ERD. The PMU also was kept from playing a direct role in liberating the city, the task of which was primarily given to the ISOF in the east and Federal Police in the West. 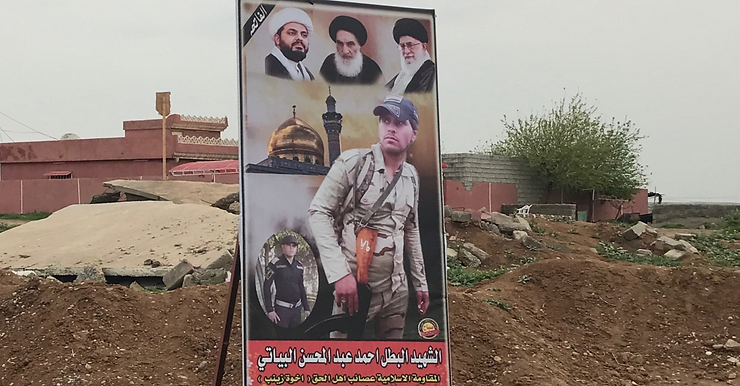 Because Mosul is a primarily Sunni city, the presence of the mostly Shi’ite PMU was seen as a provocation in 2016-2017 when the battle for the city was taking place. However since the defeat of ISIS in Mosul there have been varying degrees of controversy about the deployment of the PMU in Ninewa, the district around Mosul. There was discussion about the PMU withdrawing from these areas in the lead-up to the Iraqi elections in May and after. This appeared to be part of Coalition discussions between the Fatah Alliance, led by the PMU’s Hadi al-Amiri, and other parties. The video clearly indicates the PMU have stayed in Ninewa and seek to play a more aggressive role. The statement after confirms this. Discussions with sources indicate that the PMU base that is in proximity to the Iraqi base where US forces are located is a relatively new base that has been improved in the last two months. It is part of a deployment increasingly inside the city. The US forces know this base belongs to the PMU and sources said that the US also only recently patrolled this particular area. It is thought, by locals, to be only the first or second time that the US has patrolled this particular area. However one source told MECRA that vehicle patrols are more common. The PMU has sought to convey that these types of patrols will not be permitted in the future. The show of force appears to be designed to provoke and test the US commitment. The tensions between the US and the PMU existed in the planning stages for the battle of Mosul in 2016. By keeping the PMU out of the city, the residents were supposed to feel safer and the US was able to keep at arms distance the most sectarian and pro-Iranian elements of the PMU. However the post-ISIS phase of the conflict, which has seen attempts to stabilize this area of Iraq and prevent an ISIS resurgence comes at a time that the US administration is sanctioning Iran and as Iran has also been testing US forces in Syria. 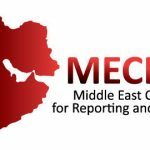 Iran’s Press TV says “this is not the first time Hashd forces stop US troops from performing a ‘suspicion reconnaissance mission’ that it argues are aimed at collecting critical information about the movements and positions of the voluntary forces in Iraq.” According to the Iranian media the PMU also blocked a US patrol in Anbar in mid-January 2019. The PMU said it had prevented a “suspicious field reconnaissance operation” by the US near the border. “The American provocations have reached such an extent as to reveal our secret intelligence on the border.” Qassem Mosleh, a PMU officer said according to several reports.